Size: 2T, 3T, 4T, 5, 6. 2T: Length:20.07. Bust:11.41. Shoulder: 9.05. 3T: Length:21.26. Bust:11.81. Shoulder: 9.45. 4T: Length:22.83. Bust:12.20. Shoulder: 9.84. 5: Length:24.41. Bust:12.60. Shoulder: 10.23. Round neck,easy on and off. 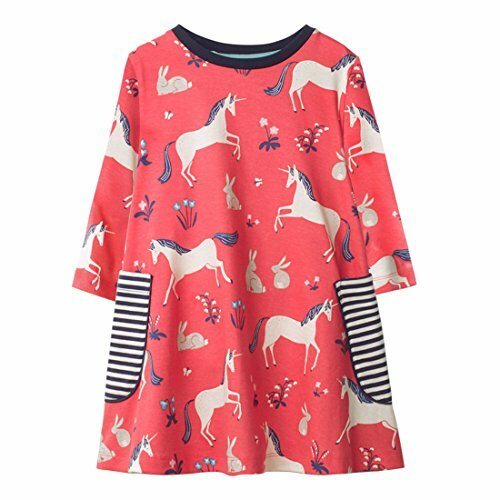 Cute cartoon print, children's favorite. Cotton fabric, soft and comfortable. Packaged well, pretty birthday gift for your girl.